…I have decided to review and examine the personalities of our favorite superhero team by using not the C. Jung or Myers-Briggs method of psychology, but rather the J.K. Rowling method. Translation: I’m going to be sorting the Avengers into Hogwarts houses. Gryffindors are brave. Ravenclaws are intelligent. Hufflepuffs are honest. Slytherins are ambitious. Though at first glance (especially for children) the four houses seem very clear-cut and easy to stereotype, that all changes as the characters (and readers) grow. We soon learn that there are almost no singularly good or bad houses, but only the good and bad people themselves. Courage can lead to arrogance or even betrayal. Wisdom can produce pride to the point of detesting or wishing to destroy anyone with lesser minds. A desire to trust others can leave one vulnerable to attack. Ambition can lead to stepping over others on the journey to greatness. As we see in the books, just because someone is placed in a certain house at age eleven does not mean that their destiny is set. Peter Pettigrew and Neville Longbottom, for example, both started off as insecure, awkward little Gryffindor boys… but both chose very different destinies as men. Almost any adult can fit into each of the four houses, but Rowling’s sorting process doesn’t take place with over-complicated adults. Growing and malleable eleven-year-olds are the ones divided into houses; they’re old enough to understand themselves, yet young enough to still view the future with innocence. So while each of the Avengers could be considered for at least two or three houses each, it’s important to consider their childhoods in regards to where the Sorting hat would have placed them. If a war were to break out, what would you rather be? Obviously, one can (and should) hope that the winning side is also the right side, but when push comes to shove, it really does come down to what or who you hope to be when all is said and done. Before you Iron-Maidens throttle me for putting Stark in the “evil” house, remember what I said above: for one, house choices do not clearly define a person’s destiny. And for another, no house is all bad — it’s just that some personality qualities can be more easily-misused than others (I think Hufflepuff is the only house without actually evil wizards on its record, but it has its fair share of weaknesses all the same). Before the life-altering experience where he became Iron Man, Tony Stark was a rich young boy with a famous father and an incredible IQ. One could argue that he should be in Ravenclaw for that, but if asked at age eleven, I get the feeling that even young Tony would have opted for movie-star fame over a Nobel Prize. His smarts were (and are) well-used, but for the first half of his life, they were more a means to money and margaritas and easy women than to any sort of ‘enlightenment’ or improvement of the human race. In fact, Stark seemed to have so little regard for human potential that he garnered most of his fortune by inventing increasingly deadlier weapons over the years. Obviously, Stark has since changed and uses his abilities to protect humanity, but he still possesses a high opinion of himself. Raised in the Soviet Union as a deadly assassin and unquestioning spy, Natasha would have been placed in Slytherin at age eleven because of her incredible ability to manipulate others and come out on top of any situation presented to her. Having been used by her captors and taught to blindly obey, she would have no desire to invest in relationships because she believed that all people were either puppets or puppeteers, and not worth investing in. So while she may not have initially possessed the personal ambition of a Slytherin, per sé, she still maintained the attitude and unattached ability to step over others that the house can be known for. Even as an adult, she can use her training to manipulate others and keep a cool exterior. Ravenclaws are chosen for their intelligence, and for their desire to pursue knowledge above all else. This choice is a bit easier to understand, seeing as Banner didn’t receive his powers until he’d already spent years as a leading scientist in the field of radiology. He dedicated his life to research and never desired personal glory or a role as a superhuman. Even nowadays, when he’s not accidentally moonlighting in green, Bruce prefers to explore the world through a microscope and wants to leave a lasting impact on science rather than on the faces of his enemies. Though he's still quite good at that, too. 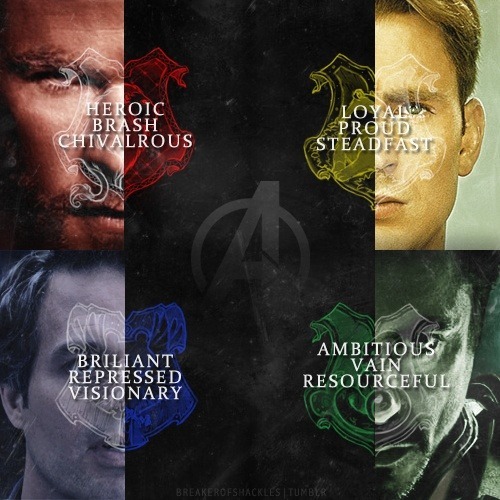 As one of the less clear-cut members of the Avengers team, Barton could be placed in nearly any of the Hogwarts houses without much of a stretch. As a boy, he grew up under an abusive, alcoholic father. After that drinking problem led to the death of both his parents, Clint and his brother ran away from the foster system and grew up with a traveling circus, where Barton trained under a master archer and swordsman. Seeing his father’s decline into madness may have had an effect on Hawkeye, training him not to give into his impulses without thinking things through: a trait that belongs both to the children of alcoholics who are determined not to repeat the cycle of their parents… and to archers taking aim. Gryffindors (wreathed in red and gold) are brave and tenacious, unafraid to dive into battle and stand to the end. This selection is another no-brainer; Thor was born to succeed his father Odin as a king, so he was raised as a warrior. For a long time, his bravery was combined with an overly-rash temper. He has since been humbled in his time as a mortal in New Mexico, but he’s no less courageous and ready for a fight when the need arises. I very nearly put Fury into Ravenclaw, because he is a brilliant strategist and runs (or should I say, ran?) S.H.I.E.L.D. on incredibly-intricate webs of intelligence. However, Nick didn’t start off as the sort of kid who tried to out-smart his enemies: he was a wild spitfire living in Hell’s Kitchen, New York, and he got into frequent fights with policemen and local gangs. When he was old enough, he enlisted in the military and fought overseas, beginning the long and winding journey to becoming head of S.H.I.E.L.D. (even though he didn’t originally have the desire to possess such a powerful role of command). Fury may indeed have a shady past and a less-than-cuddly personality, but some Gryffindors often do. He’s still tenacious and never willing to back down from a fight. Hufflepuff is perhaps the most misunderstood and disregarded house, because hardly any of its inhabitants play major roles in the events of the Harry Potter series. However, as it turns out, the house isn’t as stupid as many (including myself) might have previously thought. Hufflepuffs value goodness above all else — meaning that if Ghandi, Mother Theresa, or perhaps even Martin Luther King Jr. had somehow wound up at Hogwarts, they would have been in Hufflepuff. These students can easily be brave and ambitious and intelligent and so forth. But if they can only choose one thing to be, then they will choose to be good… even if that means they may die more easily. For the first half of his life, Rogers grew up in the Great Depression: as a result of both genetics and possible malnutrition during that recession, he was physically frail and far below the average height and weight of someone his age. However, he grew up with a strong sense of honor and morality that he was willing to stake his life on. Only after he was enhanced with super-serum did he become the near-invincible Captain America, and the serum enhanced not only his physical self but also his inner qualities: loyalty, honesty, and humility. Rogers grew up as an often-overlooked weakling, but as a result he came to value righteousness even above the ability to fight successfully. Being on the winning side of a battle means nothing to him if that side is the wrong one, and he’s not afraid to confront his trusted friends when he thinks that they’re stepping out of line. As a result, at age eleven Steve may have very well ended up in Hufflepuff. While not known by most movie fans as one of the Avengers, viewers of Marvel’s highly-popular television drama Agents of Shield know that Nick Fury himself considered Coulson to be a member of that elite team from the beginning. Even though Phil started out as relatively unknown and under-appreciated by his superhero counterparts, he has since become the new director of S.H.I.E.L.D. and is rebuilding the organization from the ground up so as to keep from repeating Fury’s mistakes. He’s honest, sincere, and willing to take responsibility for his shortcomings. Coulson’s humble beginnings and his admiration of integrity-driven Captain America can be clues into where the Sorting Hat might have placed him as a child. He grew up fascinated by superheros, and he knows their strengths and weaknesses enough to arrange their teams like nobody else. Power like that could easily go to someone’s head, but Phil’s goal is to combine heroes for good and not for evil. He’s not only used to being disregarded, but can even use his invisibility to his advantage by being a positive influence on others from the sidelines, even if it takes a lot of patience for his plans to pay off. Needless to say, this entire “Sorting” has only been the result of one perspective: mine. I’m sure many of you think that certain Avengers should be elsewhere, and you’ve got an equally-long essay to back up your theory. If that’s the case, then fire away, dear readers! Lecture me in the comments about who I’ve misjudged, and sort the Avengers for yourself! While you’re at it, what about those other valuable characters like Loki (coughSlytherinwinstheHouseCupcough), Maria Hill, Leo Fitz, and Rocket Raccoon? Show those Marvelous heroes some love! Awesome job, Rica! I agree with all of your sorting. I'm a member of Hufflepuff, so I especially enjoyed that section, and I'm proud to be in the same house as Steve & Coulson. As for the others you mentioned, Loki is the Slytherin Prefect. Maria Hill & Leo Fitz both strike me as Ravenclaws, and I think Rocket probably fits in Slytherin, too. After all, he's pretty ambitious and cunning. I'm suddenly in the mood to sort even more characters! I agree with all of your sortings! As a Slytherin myself, I agree that we're defined more by ambition than evil. (In fact, I might even put Loki in Ravenclaw, for all his studies of sorcery. I mean, Slytherins are SO MUCH BETTER at planning.) Oh god, I want a crossover fanfiction on this SO MUCH. I'm completely with you on these! Bonus points to you for including Coulson, by the way. It's always one of my favourite things when a fandom does the HP sorting test on its characters--when you've got all the houses represented, you know your fandom has a well-rounded group of characters. I agree with all of these except for Tony. I would have put him in Ravenclaw for a number of reasons but I don't have time to write all of them down right now so here's one of them: because even he describes himself as a futurist and Ravenclaws tend to look to the future while Slytherins look towards the past. Look to the past??? Might I ask where you got that idea?? I don't think someone who was focused on the past would try to change the world (referring to Voldemort and his death eaters). And as a Slytherin myself, I can say that I'm definitely more future-oriented. Perfect Sorting! Especially Tony. He could be a "slyther-puff" though, watching how he transformed. This is great! There were definitely some where initially my response was "wtf no" but that's because I was viewing them as adults--when thinking about how they would have been sorted at 11, I agreed with...pretty much everything. As an adult, Loki is DEFINITELY a Slytherin, but as a child...well, he could still have been a Slytherin, but I could also easily see him being sorted elsewhere. Ravenclaw would be a good fit, for certain. Hmm, I wonder about Bucky, though...I could see him being a Slytherin, too. I mean, he's loyal to Steve...and pretty much only Steve. Then again, I don't really recall seeing him interact with many other people, anyway. Any thoughts? YES! Tony is a Slytherin. He's the textbook example of what a heroic Slytherin would be, had Rowling actually stuck to what the Houses were supposed to originally stand for. And cunning, intelligence, courage aside, I think it boils down to the fact that Tony's defining trait is being determined to do everything his own way, for better or worse.